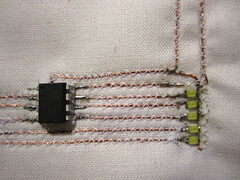 Sewing Karl-Grimm copper conductive thread as bottom bobbin thread in sewing machine and soldering cut up pieces from a Neopixel strip to these lines to have custom placement and spacing. 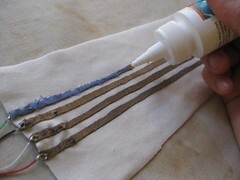 Conductive copper paint from LessEMF mixed with lubricant and screen-printed on to fabric. 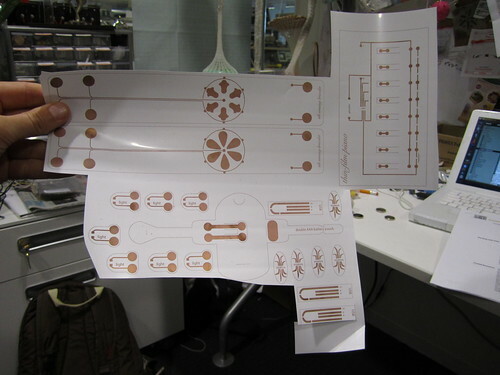 This print was made during the Screen-Printing Circuits Workshop held at the 2014 E-Textile Summercamp. 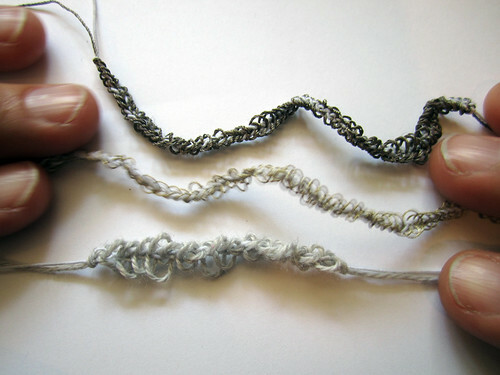 When you need you conductors (wires) to be stretchy, one option is to crochet, knit or braid a conductive thread (or even a wire) alongside some elastic. Make sure to tension the elastic as you go so that ultimately the elastic bunches together the strand, allowing it to stretch a certain amount. 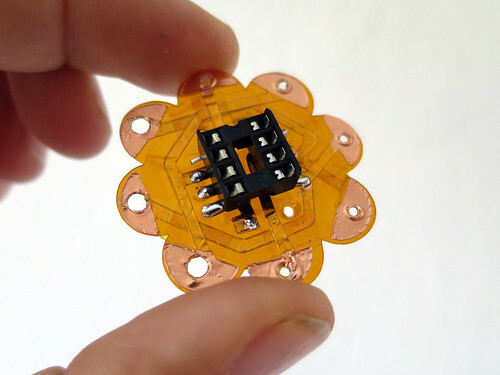 Plug and Wear makes and sells a knit perfboard. 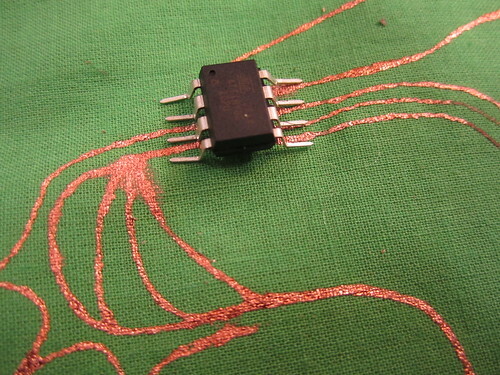 Alternate rows and knit with wire and a non-conductive synthetic yarn so that parts can be soldered to separate rows, similar to a traditional breadboard. 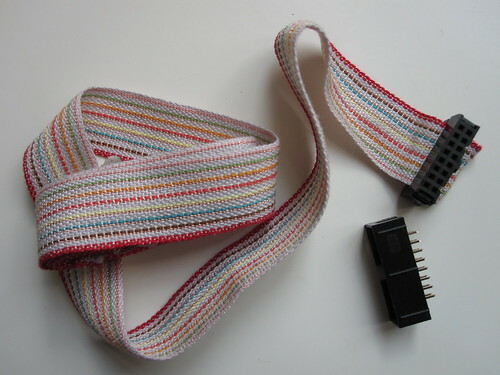 Dan Riley (www.scisci.org) made a beautiful Fabric Ribbon cable. 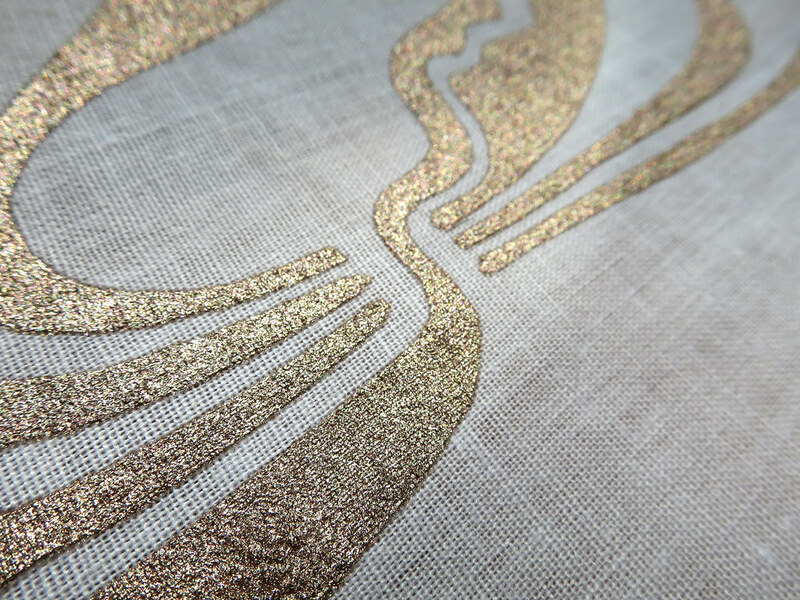 8 separate lines of conductive threads are woven into the fabric. The end of the cable is connected to normal 16 pin plug as normal ribbon cable. 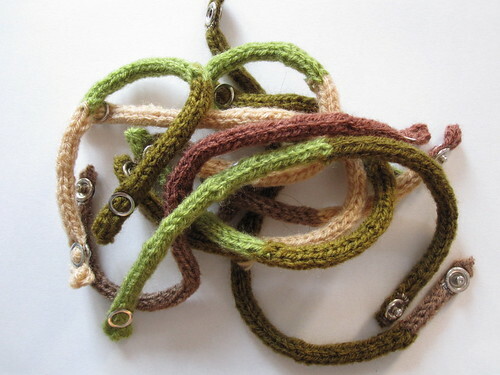 Using stretch stitch on sewing machine, you can create stretchy fabric cable. 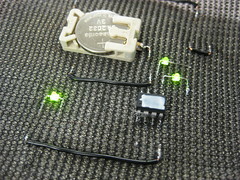 The picture shows 9 line stretchy fabric cable, which resistance is 150 ohm/m. 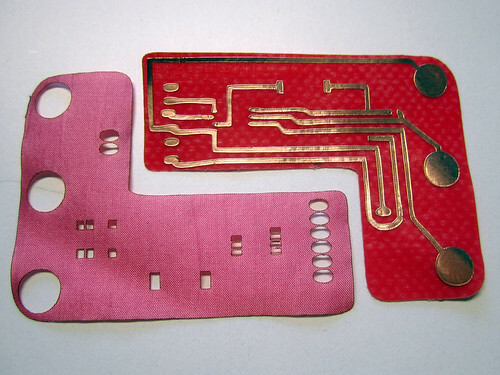 In most applications it is important to isolate the conductive traces. For stretchy traces this requires a stretchy isolation. So far we have experimented and had good results with: stretchy fabric glue, puffy fabric paint and extra layers of fabric. 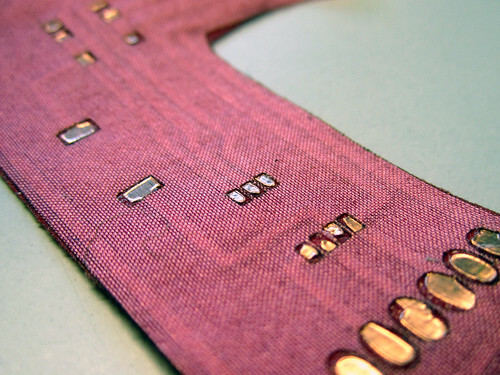 Stretchy conductive traces are great for wearables because their stretchiness makes these traces comfortable and durable against wear and strain. 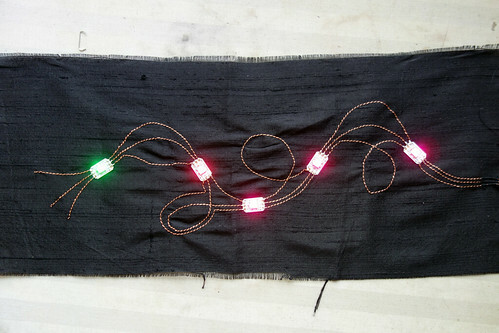 You can make a whole circuit using conductive thread and fabric. Here is some tips, DOs and DONT DOs.. that are learned from many mistakes we made in our past trials. Non-stretchy traces make very stable connections on a non-stretch fabric but make less or no sense when working with stretchy fabrics. 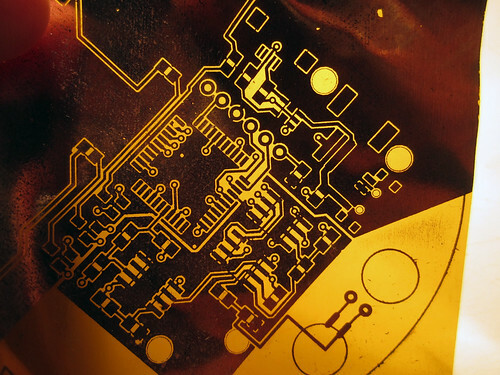 We haven’t done any consistent experiments for washability of conductive fabrics, threads and connections. But we have washed the Perfect Human costume containing the neoprene bend sensors more than twice and it is still functioning as before. 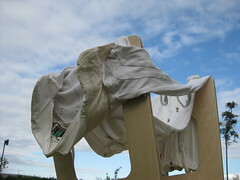 We excluded the collar and the circuitry from these washed.